Kevin and Rebekah Porter with their children (from left) Lily, 9; Zy and Ray, 3; Natalie, 12; and Everly, 6. 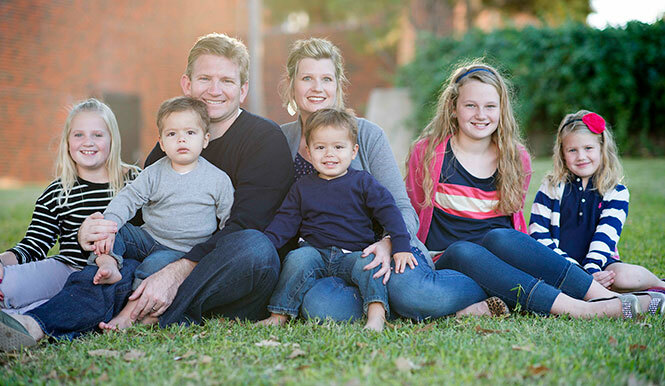 Kevin (’99) and Rebekah (Dawes ’00) Porter knew that God had called them to adopt. “Even still, without shame, I admit that we were all scared to death,” Rebekah says. The 9-month-old twin boys they were presented for adoption had been born eight weeks premature, and because of trauma, abuse and neglect were only at a 3- to 4-month level of development. Ultimately, the Porters didn’t let their fear get in the way, and in April 2013 they added Ray and Zy to their family. Enjoy Rebekah’s account of their faith journey, as we continue our series about Abilene Christian University alumni who have followed their hearts to adopt. Kevin is vice president of human resources at Lauren Engineers & Constructors in Abilene, and Rebekah is a stay-at-home-mom. I will never forget the first time I laid eyes on them. Oh my heart. Were these my babies? The process had started with a huge stack of paperwork just months before, although God had been leading us to this journey from the early years in our marriage. Adoption was a word we threw around loosely from the beginning. Oh sure, we should adopt some day … as if it were no big deal. The season came when the Lord began to soften our hearts and make the far-off dream of adoption a reality. I can go back to that moment so easily. January 2012. God, what are you up to? In the stillness of the moment, my heart is pounding and I sense you are about to do something wild and crazy in me. What is it? These words were straight from my journal. After several confirming and outrageous events my husband, Kevin, and I along with our three girls began a journey of absolute trust with Father God as he led us to expand our family through adoption. Trusting God’s character and heart for us is where the journey truly began. Even as I write this, my heart is swelling with similar emotions that I felt as we heard the Lord ask us to partner with the foster care system in Texas. We knew. Absolutely knew that God had called us to adopt. Even still, without shame, I admit that we were all scared to death. We had no idea what we were getting ourselves into. So many times one, if not all of us wanted to run, like Jonah. Satan hates redemption. He hates the orphan and the outcast and will use fear, doubt, insecurity and flat out disobedience to keep them isolated and lonely. But God. God is the one who sets the lonely in families (Psalm 68:6). Regardless of our fear of the unknown, fear of what ifs, fear of the future, or fear of losing, God’s goal was to restore hope and healing to the orphan. Although it would have been easy to stop the process, become numb and paralyzed to what he was asking us, we pushed through. We trusted. And He was faithful with us every single step of the journey. He was with us in the darkest moments and He was with us in the most joyous times. Faithful. We heard about the 9-month-old twin boys who were in need of a new placement. Twins? Twins. We really wanted a boy, but the thought of two of them was quite overwhelming. How in the world could we parent well to five kids? Are you sure, God? Twins? Twins. We were able to meet and hold the boys during a supervised visit before we ultimately decided to accept the placement. They were born eight weeks premature and along with trauma, abuse and neglect, they were only at a 3- to 4-month-old development, which meant they could not sit up or crawl. They both had torticollis; one of them had to the wear a helmet to help with his severely misshaped head and what they had lived through to this point in life was just about too much. The girls fell head over heels immediately, while I felt this wall slowly start to creep up in my heart and Kevin was unsure if this was the best scenario. The fear in their eyes matched the fear in my heart. When I looked into those big brown eyes, I was not overcome with an infinite supply of love or an instant connection like I expected. Instead, I saw lots of wounds and heartache and every reason not to love them. So, for the next few days we prayed, we thought, we talked, we prayed, we cried, we questioned, we thought, we prayed, we questioned. We had no idea what their long term health would be. There was no way of knowing if physical therapy, Early Childhood Intervention and speech therapy would do any good. We had no clue if we would have happy, healthy babes or those with severe mental, physical and/or emotional challenges. But God. God knew. He knew every detail about the boys and loved them more than they will ever know. He had plans for them, plans to give them a hope and future; plans to prosper them (Jeremiah 29:11). Above all else our hearts’ desire was to be aligned with His, so we trusted and said yes. My once manageable life turned to complete chaos that day in the middle of June when we picked up the twins from the agency. That was the day we became a family of seven, even though adoption would not be final for several months. That was the day we put our hearts on the line to love. To love is to risk. We are going to call him Ray. I was excited to send this text to my dad because he shared a middle name with one of the boys. Sadly, this was the last bit of communication I had with my dad because late that very night we received the most horrific phone call from my mom telling us that my dad, at age 58, had a massive heart attack and passed away. Trust. The days and weeks ahead were the hardest I have ever faced. I wanted to quit. I wanted to give up, and quite frankly I wanted to give them back. My heart hurt too much to open it up to risk and to love. Going through the motions mostly, I cared for them, changed them, fed them and cleaned up after them. I loved them, but I would not let myself get close to them. Kevin was bonding with them, but that place of security that I had created kept me from bonding. Never had I needed Jesus more. I sat across from the boys one morning over breakfast. One of them was just crying and crying. I could do nothing to settle him. Our eyes met and I heard his heart scream out: “I WANT MY MOMMY.” For the first time, our hearts collided with the same longing. I wanted my daddy. That moment my heart shifted and the wall rattled. We were facing similar loss and were all in a place of desperation. Our only hope was to trust. That wall did not fall immediately; it was a process. There were more significant moments and little milestones that caused the bricks to start to crumble. Parental rights had been voluntarily terminated, and I battled being ecstatic that we were on our way to final adoption and feeling like, “Oh, crap. This thing is for real.” CPS had come for a monthly visit with news we were not expecting. The bio-mom had changed her mind. She would appeal. My heart jolted and my eyes filled with tears. The caseworker was talking but I could not hear her. All I knew was that we were in jeopardy of losing our boys and that was not OK. Finally, it was not OK. Wall down. I began to pray more and more for their bio-mom, and God gave me a love for her. I saw her in the courtroom when we went to see if her appeal would be granted. I wanted to run up and hug her, but that would be weird so I refrained. I asked the Lord to show me where He was that day in the courtroom. In my head, I saw Him standing behind her as she pleaded to the judge. I knew no matter the outcome we could trust that He was there. Decision denied. Motion to move toward final adoption approved. I looked at my kids differently when we returned home that evening. Five kids. I had five kids: three birthed from my body and two birthed from my heart, yet all mine. Again, I was overwhelmed. This time I was not overwhelmed with fear, but feelings of gratitude and humility. God had deposited a tiny dream within us years ago and was beautifully faithful to complete it. The journey is not over, for we have a lifetime to live it out. The boys completed physical therapy, speech therapy and ECI. At 15 months, they were tested in gross/fine motor skills, cognitive skills and speech. Not only did they meet 15-month goals, they were meeting goals of an 18 month old and 24 month old. They have been healed of torticollis, and skull surgery for the one in the helmet was not needed. They are happy, healthy and absolutely adorable. They talk up a storm, sing all day long and make us laugh. A lot. Not only does God give, he gives abundantly! God continues to refine my heart and restores each breath with oceans of grace. He is all that we need for today. He is faithful and He is good. The road is not easy. Lots of days I want to scream (and sometimes do) and pull my hair out, but running or hiding is less of an option. Lying beside them before they fall asleep at night, hearing them sing and tell me about every kind of car, truck and tractor they saw throughout the day, melts me. Loving them from an unprotected heart is the only real way to love. God has a direct line into our hearts through Rebekah and Kevin’s journey of adopting the boys and the remarkable ability to communicate that journey with us through her writing. Our family is truly blessed that Kevin and Rebekah met at ACU and continued life’s journey together. I remember Don Dawes and all your family from the Rotan Church of Christ days! Awesome story! God is good! Love the adoption series! Thanks for doing this. Hopefully it will encourage couples to look into adoption. There are many kids who need a family!